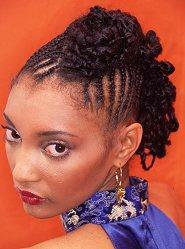 Cornrow braid styles are numerous, and range from straight braids to more complex and dramatic looks. These braids are plated flat against the scalp, and traditionally the braids appear in straight rows along the head. However, there are many ways to create a unique design beyond the basic cornow style. A more intricate version of conrow braids involves creating a design pattern as the braids are created. Designs include geometric shapes, zig zag patterns, criss-crossed braids, or other patterns, including words or symbols. 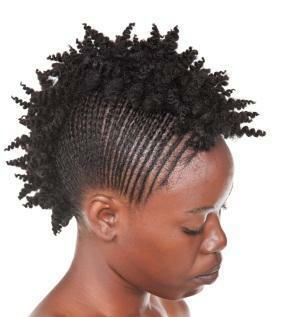 The finished look is often considered a type of hair art, and can be simple or complex, depending on what you want and the ability of the braider. Stylists are likely to have photographs of their work, and examples of different styles to chose from. Some people prefer to create their own designs and styles, perhaps combining some ideas and designs. Most good stylists will be able to take your design and transform it into reality. Hair extensions are sometimes combined with cornrows, and this can add to the design opportunities and increase the style options available. To incorporate extensions in with your cornrows, begin cornrowing the hair normally, and then add real or fake hair extensions into the braid, a little bit at a time. Then, continue the braiding process, and the extensions will be securely braided into the hair, and the cornrows will look longer. Once the extensions are braided in to the hair, you may need to take a small scissors and trim any ends that are sticking out. When cornrows have been braided into hair, it is still possible to change and alter the style. For instance, on long hair where the braids hang loose at the end, all the braids can be braided together to form one single braid. You can also take the braided ends of the hair and put them in a ponytail or a low side bun. The braids can even be curled with a standard curling iron and pinned near the top of the hair for a more formal look. The half cornrow style can create a unique look for any woman. Cornrow braid part of the hair either straight back, or starting from each side land leave the middle of the hair unbraided. Maintaining this style of cornrows can take additional effort, but it leaves wearers with a unique look that is perfect for special occasions or creating a one-of-a-kind style that truly stands out. Cornrow braids are a very popular option for men. Men's styles of cornrows tend to end at the nape of the neck. Before getting cornrows men should make sure they have approximately 4 inches of hair. 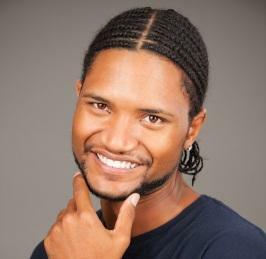 Men most commonly braid their entire head in cornrows in styles that feature straight lines or zig zag lines. Unique braided patterns, and braided patterns that cross each other were made popular by celebrities such as Ludacris and Allen Iverson. Some men also choose to wear the reverse braid style of cornrows. These braids lie flatter against the head than the standard braids. 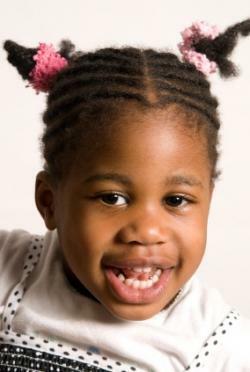 Cornrow braids are a popular option for many African American children. 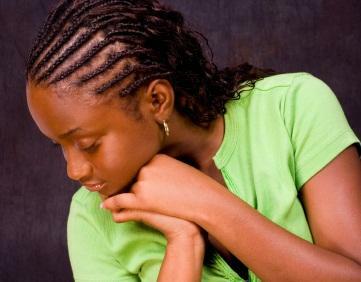 The low level of work required for everyday styling will benefit children, but parents should be aware that cornrows take several hours to complete. Keeping a child still and occupied for that long while the braids are being done can be a challenge. Styling a young girl's cornrows is typically different than an adult's. Often only the front part of the hair is braided so the back of the hair can still be curled or put into pigtails or ponytails. The ends of braids are typically secured with colorful hair ties or beads to give girls a more fun style. Far from being predictable and boring, cornrow braid styles can be customized and unique, letting everyone choose the best braided style to suit their hair, personality, and lifestyle. The right style of cornrow can give anyone a unique look that they are sure to love.